The campaign will also be the biggest in the brand's history in the Philippines. TASTE THE FEELING. The Coca-Cola Company partners with the world’s top creatives in fashion, music, and the arts to give its new campaign a more sensory feel. 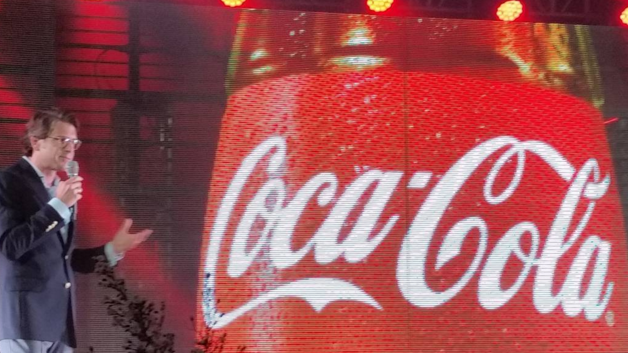 MANILA, Philippines –The Philippine unit of The Coca-Cola Company took part in the globally synchronized launch of “Taste the Feeling,” the softdrink giant’s newest campaign covering all Coca-Cola trademarks Coke, Coke Light, and Coke Zero. During its Philippine launch on January 21, Coca-Cola Philippines Vice President for Marketing Stephan Czypionka said the new campaign will be different from its earlier efforts, including the “Open Happiness” campaign that was rolled out in 2009. For one, the product will again be the “hero” in this campaign. “The simple pleasure of drinking Coca-Cola makes any moment special. That’s the campaign idea and that’s so important to us,” he shared. “What really makes us happy is the sum of all these everyday moments and Coca-Cola wants to make these more special and memorable,” he added. BACK TO ROOTS. Coca-Cola Philippines VP for Marketing Stephan Czypionka says the new campaign will place the product at the heart of all its communications. In an interview with Entrepreneur Philippines, Czypionka explained that the “Taste the Feeling” campaign was grounded in the brand’s core value—happiness. And according to him, this is the reason behind the decision to go back to its roots. Marketing-wise, the new global campaign will be more product-focused and down-to-earth, evident with the initial set of photographs, music, and videos rolled out during the launch. Czypionka said that there is a significant shift with the way the photographs used are produced. The Coca-Cola Company (based in Atlanta, Georgia) commissioned fashion photographers to do the job. To complete the experience, TV and online commercials will also have a new sound. For the brand, music has always played a big role in its advertising efforts. TOP OFFICIALS. 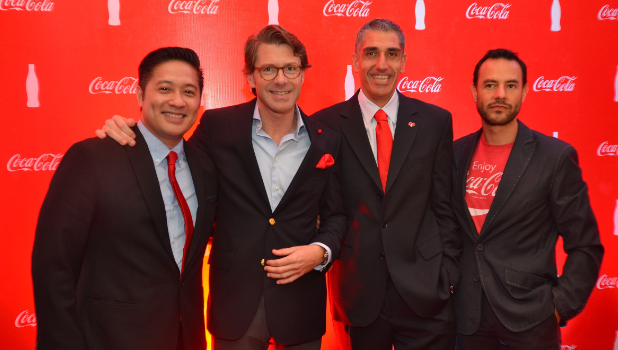 Most of Coca-Cola Philippines’ top executives joined major distributors and members of the press who gathered at The Manila Peninsula in Makati City for the new campaign launch. From left: VP for Public Affairs and Communications Adel Tamano; Czypionka; VP for Finance Eduardo Rearte; and VP for Integrated Marketing Communication Jesus Ferreira. The campaign will be the biggest in the brand’s history in the country. Apart from the heavy budget for TV and online advertising, Coca-Cola Philippines is set to distribute 4 million samples and create 4 million moments of happiness for free within a 6-month span of the launch, bringing the “experience” to various universities and public venues nationwide. Czypionka said social media will play a big role for “Taste the Feeling,” something that was not done in most campaigns in the past. It has even put up a 24/7 Consumer Interaction Center to keep in touch with the lovers of the brand and with others who may want to connect with the company. Coca-Cola, founded in 1886, regards the Philippines as an important market, as the country was the first venture of company outside the U.S. The first bottle of Coke was sold in Manila in 1912. Czypionka said that in 1912, their colleagues from then had a very simple job. They sold one beverage, Coke, in one bottle format. To date, the company is selling 18 different brands across seven beverage categories. “We offer 42 different beverage options. Our teams are still working hard to increase the number of options every year,” he said. 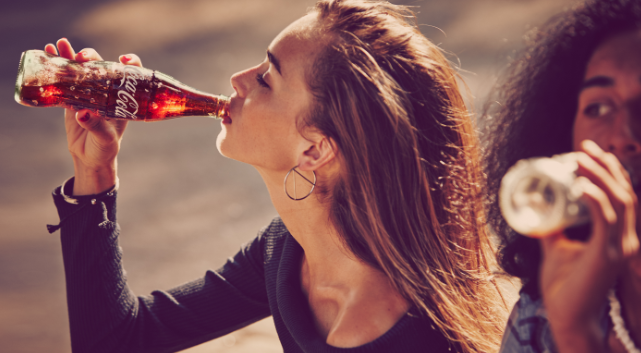 In the third quarter of 2015, the Philippine bottling partner, Coca-Cola Fomento Economico Mexicano S.A.B de C.V. (Femsa) announced a $1.2 billion investment until 2020 for the expansion of the company’s facilities, as well as to beef up its distribution and operations in the country. Currently, Coca-Cola Philippines operates 19 bottling plants nationwide, employs more than 10,000 Filipinos, and sells its products through over 900,000 retail outlets across the country. NEW SET OF BRAND AMBASSADORS. 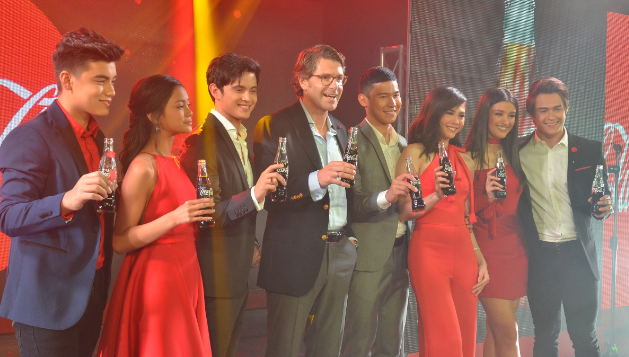 During the new campaign launch, Coca-Cola Philippines also presented some of its newest ambassadors. From left: Bailey May, Ylona Garcia, James Reid, Czypionka, Enchong Dee, Janella Salvador, Liza Soberano, and Enrique Gil.